I had a good chuckle the other day when I was caught by an example of numerical illiteracy on the part of at least two people: an author and an editor. I had to share. I can take no issue with the first section on young billionaires as it was actually quite interesting. In the second section, I am entertained by the translation of $122.1k GDP per capita to an average income of about $120,000 per year. Taking the crown though, was the gem at the bottom. 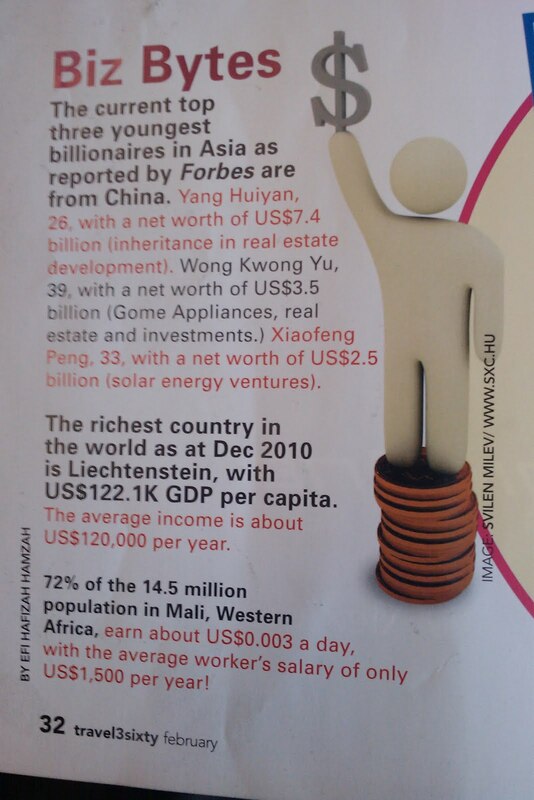 "72% of the 14.5 million population in Mali, Western Africa, earn about $0.003 a day with the average worker's salary of only US$1,500 per year!" Now what is that supposed to mean? Before you reach for your calculator I can tell you that $0.003/day = $1.10/year. Also I can tell you that 72% of 14.5 million = 10.44 million. And that (10.44 million people * $1.10 per person per year ) / $1,500 per worker per year = 7656 workers. And that 7656/10.44 million = 0.07% employment. Curiously I can't quite determine what I think they were going for. Anything I try to explain the numbers I see gets destroyed anyway by the strange "72% of 14.5 million". According to Wikipedia, only 43.51 million out of the 81.76 million people in Germany are employed. I suppose I could say that 53% of Germans earn about $0 per day. By adding a dash of real workers I could make that figure $0.003.